You ever wake up in the morning and suddenly your room seems different? Or you notice new things you’ve never noticed before as you’re travelling the same route you’ve been taking to work for years? It’s like, something’s changed….and you’re right! Something DID change-YOU! You chose different and as a result you became aware of things around you which you may have taken for granted or looked at only from a certain angle. Well, that happened to me yesterday; rather I chose to look at my surroundings differently. Although I have not been attending hot yoga classes as often as I should, I had decided to go that afternoon with the will to make it a great class. As I walked to the studio I consciously chose to simply listen and follow the teacher’s instructions. Often, during the class, I allow my thoughts to follow the hodge podge of randomness that enters my head uncontrollably. Hence, on this day, I chose different. I had a great class as the focused state of mind I forced myself into, allowed me to approach the poses differently and reach new depths. After the class I walked home via the same route I usually take. I stepped onto the street and started walking. It felt as if I was looking at my surroundings for the very first time. I looked up at the large church on the corner and noticed the way that the sunlight was casting interesting shadows on it and how blue and clear the sky was as I looked up at it. It was beautiful. As I walked past the church, I heard music coming from the restaurant across the street (which I also pass by frequently but never paid much attention to) and stopped for a few minutes to listen. It was lovely and I am sure it made for a lovely atmosphere for the people sitting at the restaurant’s patio, enjoying their meals. On this same route, I pass a park. I noticed the people in it and how much they were enjoying it’s beauty. I saw a man playing his guitar; friends sitting on a bench and talking; people sitting on the ground observing and perhaps even meditating; people walking their pets through the park….all forms of life were in that park and it seemed as if it was a scene out of a movie but more perfect because it was real life and in front of me. Why haven’t I paid attention to all of this before? Why haven’t I sat in the park and been a part of it? Why do I always walk so fast and pay attention to me instead of my surroundings? I reached the end of the park boundary, and caught scent of what I would describe as joy. 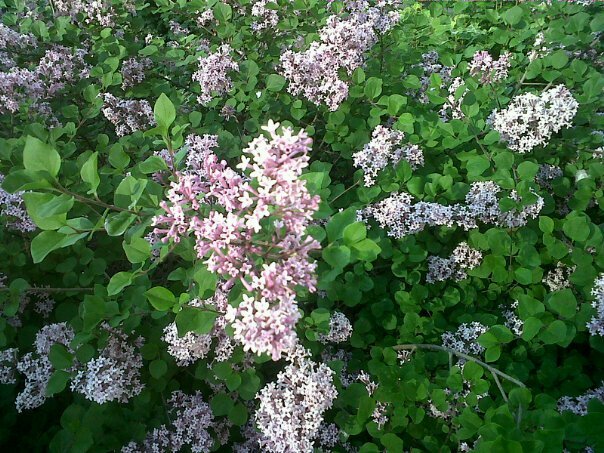 It was a bush of the most amazingly fragrant, wonderfully scented lilacs (I think that’s what they are). I had walked passed it but the wonderful fragrance invited me to go back. And guess what? I wasn’t the only one! A gentleman did the exact same thing! He also passed the bush but turned and went back. We exchanged a few words and expressed how beautifully fragrant the flowers were. Although we only really stayed there for a few minutes, it was a very cool interaction. It may have been a small thing but it showed that sometimes looking at things outside of your comfort zone/repetitive doings, and choosing to look at things with a different point of view (or a ‘different set of eyes’), can make your world better than it already is and that we can find happiness and joy in the things which surround us. If you decided to choose different, share your story! This entry was posted on Saturday, June 4th, 2011 at 6:04 pm	and tagged with Different, Mindset, Viewpoint, Walks and posted in Bad day, Choice, Great Day, Mindset, Uncategorized. You can follow any responses to this entry through the RSS 2.0 feed.